This Giveaway Starts TODAY and ends on Saturday OCTOBER 17th.. winners will be announced on Sunday October 18th and Prizes will be sent out the following week. Why Mystery Boxes??? I just love mystery boxes… its like christmas! you never know what you are getting! Open Internationally and to everyone! Like mentioned, The Giveaway is open from Today September 17th-October 17th and the winner will be Announced on October 18th! Bonus Points if you Follow me on INSTAGRAM @Jahanara.plantbased. My favourite makeup product has to be a good blusher, I’ll usually use it as eyeshadow too! Awesome 🙂 I love using my blushers as eyeshadows too 😀 thanks for entering and good luck!!! Sounds like a great giveaway! I love a good concealer which gets the job done well, and am partial to a nice pink lippy! My fav beauty product is sleep! A good nights sleep makes you look so much better!! I did number 1-4 fingers crossed!! Love it! Going to do all the above. My favorite makeup item right now is actually The Maybelline Mastershape brow pencil I just posted about. I have been using it almost everyday. Great giveaway! Check out this awesome giveaway peeps! Thanks! Even if i dont win, this is very generous of you. I love Pacifica….their lip butters and their cc cream! Great company!! Aww, what a fabulous giveaway!! This is so generous of you. ❤ I'll enter too. =) Umm, hmm, favourite makeup product? I guess I'm a lipstickaholic for sure, and I should definitely be looking into a good concealer or foundation, but to heck with it, I don't want to make makeup-responsible. =P Bright blush is always the way to go! well you guys deserve somethin for putting up with me and my silly gifs 😉 haha! Thank you for entering 🙂 and best of luck! Lately my favorite makeup product is Tarte Amazonian clay eyeshadow! Oh you are just so nice! I saw that you visited and are a follower of my blog. So I wanted to come see what yours is all about 🙂 I’m just loving it all. Followed on Twitter @agvoss Instagram avosslm tweeted and subscribed to the blog. Thanks for running such a great giveaway. Lipstick is my favourite product, because if I don’t have time to do the whole deal, that’s what I use! I followed you on instagram (@rosesforann) and i reblogged and tweeted and all the other stuff! Lipsticks have to be what I love the most. I’m currently loving Obsessive Compulsive Cosmetics lip tars in Anita and Black Metal Dahlia and Lush lipsticks! I love your blog btw! Hey! What an awesome idea, it gets people interacting and super excited about cruelty-free products, win-win! I love a good blusher, but I’m beginning to sway towards bronzing products at the moment as the sun has been out in full force recently here in Oz. 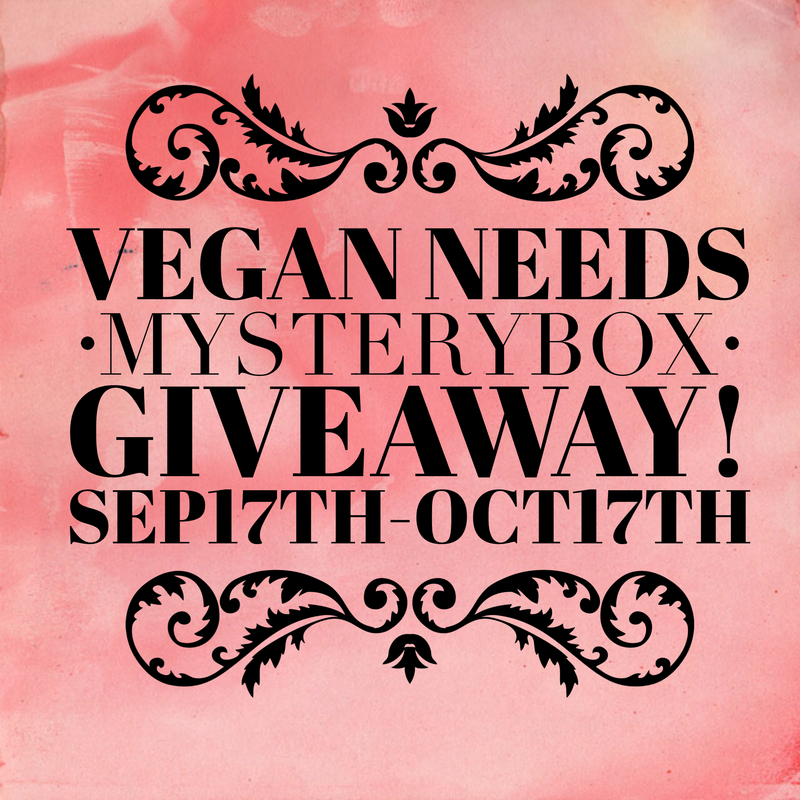 Pingback: Vegan Needs MysteryBox GIVEAWAY!!! | Without Cruelty Blog. Live. Love. Travel. I love a good concealer, must have an excellent eye cream and moisturizer! This is awesome! Followed you on instagram and twitter! I haven’t tried much vegan beauty products. And i’m just in the beginning of my journey to healthy non toxic beauty ingredients. I love lip products. And I find this exciting. A box full of vegan and cruelty free is like heaven! This is such a fun giveaway! AND vegan =) I would say eyeliner is my favorite.